Michael R. Docherty has practiced law in the Twin Cities for 30 years. He practices primarily in the areas of personal injury, business litigation, corporate law, and wills and probate. 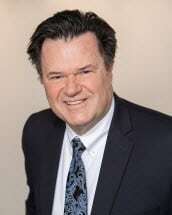 Mr. Docherty represents individuals in many types of lawsuits including personal injury claims, insurance claims, contractual disputes, business ownership and shareholder disputes, noncompete agreements and lease disputes. He counsels businesses and individuals on a myriad of issues including business formation, contract drafting and review, noncompete agreements and corporate governance. He counsels individuals on estate planning issues and prepares wills, trusts, powers of attorney, health care directives, and other estate planning documents. He has represented businesses of all sizes in court, from Fortune 500 Corporations to sole proprietorships, as well as individuals. Mr. Docherty is strongly committed to excellence in advocacy and client service. He prides himself on providing quality representation in a cost efficient and timely manner. Mr. Docherty graduated with honors from William Mitchell College of Law in St. Paul, Minnesota, where he served as Editor-in-Chief of the Law Review, and subsequently served as a law clerk at the Minnesota Court of Appeals. He served as an adjunct professor of legal writing at William Mitchell College of Law. He has been active in a number of community and pro bono activities. Mr. Docherty is rated AV (highest rating, based on peer review) by the Martindale-Hubbell Law Directory, used by law firms and corporate counsel throughout the country. He has been recognized several times as a "Minnesota Super Lawyer" by Minnesota Law and Politics and other magazines in statewide surveys of attorneys.